NEW !!!!! B82 Maidbronn on the Night of the Stars on X:enius of the program ARTE on August, 8 2015 at 08:35UT, 10:35MESZ, NEW !!!!! 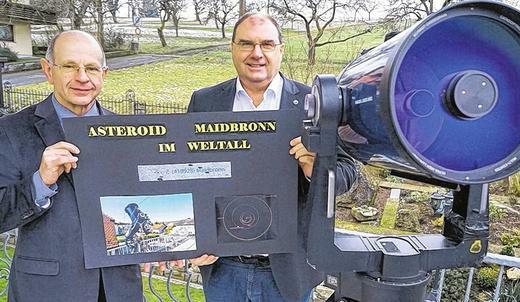 Unendliches Universum - auch grenzenlose Sicht? -> Infinite Universe - also limitless view? 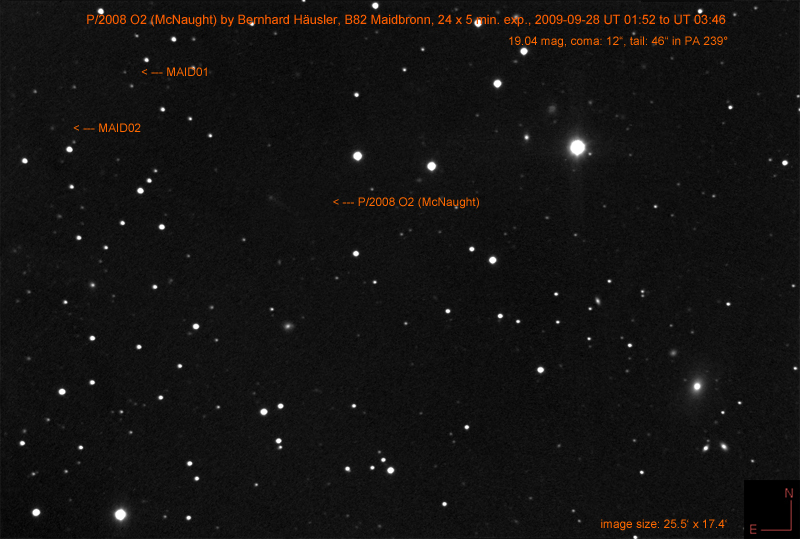 At September, 28 2009 I discovered a new main belt asteroid on a series of images of comet P/2008 O2 (McNaught). Only through the collaboration between many observers of the world, the orbits of Minor Planets and Comets can be secured. To be a small part of this global work of astromomers and amateurs makes me very happy and proud. Behind every discovery or recovery of an object in space is standing an exiting story. But the most important part of these extraordinary stories is the collaboration in friendship with like-minded guys around the world. 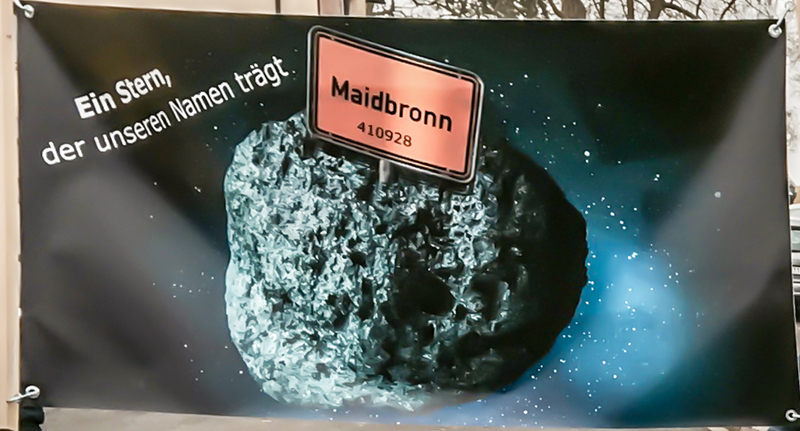 More new informations of the discovery of Minor Planet Maidbronn you find here, updated in July, 2015. The original purpose of the photography was the measurement of the orbit of comet P/2008 O2 (McNaught). MAID02 (K09SO2T) is a new object and my first named discovery. MAID02 = 2006 BN60 = 2009 ST242 = (410928) Maidbronn. Antonio Garrigós Sánchez (B37) confirmed the object at September, 30 2009. Thanks a lot for this great work! Also thanks to Josep M. Bosch (B74), the discoverer of the Apollo Asteroid and Near Earth Object (NEO) 2009 ST19, who helped to make the contact to Antonio. The comet and the two asteroids in their orbital situation at September, 28 2009. All objects almost in line. OBS Antonio Garrigos Sanchez,Turruchel G.,Carlota G.
Josep M. Bosch (B74) observed the asteriod on February, 5 2011 on its third opposition. Many thanks for this job! From 48 observations at 3 oppositions, 2006-2011, mean residual 0".56. Last observed on 2011 Mar. 4. Perturbed ephemeris below based on elements from MPEC 2011-E28. Below are the results of your request from the Minor Planet Center's Minor Planet Ephemeris Service. Ephemerides are for observatory code B82. From 66 observations at 5 oppositions, 2003-2010, mean residual 0".39. Last observed on 2010 Dec. 5. Perturbed ephemeris below based on elements from MPO 190702.